In 1995 a great New Zealander pulled on a pair of red socks and set about winning one of the world’s oldest and most coveted trophies against some of the world’s best and most powerful sailing teams. Sir Peter Blake’s legacy continues to inspire kiwis to achieve their dreams, no less so at this year’s America’s Cup, where sailors in the J Class Yacht Regatta wore red socks in tribute to the indomitable spirit of Sir Peter Blake, and to show support for Emirates Team New Zealand. Among the competitors at the J Class Regatta were a number of New Zealanders that used to sail with Sir Peter Blake. Six such yachtsmen were crew on the J Class yacht “Ranger” – Erle Williams, Brad Butterworth, Tony Rae, Matt Mitchell, Mark Hauser, Jeremy Scantlebury, Godfrey Cray and Owen Rutter. Rutter not only sailed with Sir Peter Blake, but is also a Director of Events Clothing Company, which supplies red socks to the Sir Peter Blake Trust, uniforms to Emirates Team New Zealand and high performance uniforms to New Zealand businesses and international Superyachts. At his instigation, all 30 of the international crew on board Ranger wore red socks at the J Class yacht promotional race prior to the first America’s Cup race. According to Rutter, “those of us who were fortunate enough to sail with Sir Peter Blake are enormously proud of his legacy and keen to remind people to show their support for the Sir Peter Blake Trust on Red Socks Day this July 7th”. 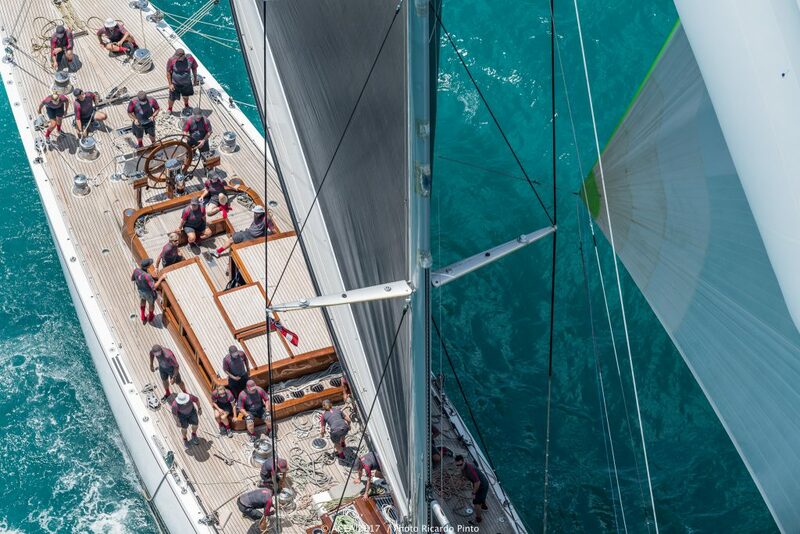 J Class fleet racing is one of the most spectacular sights on the world sailing circuit. Seven J Class yachts attended the 35th America’s Cup Regatta, with yachts that were built and have been racing as early as in the 1930’s. On this class famous names, such as Lipton and Vanderbilt, competed for the most coveted sports trophy of its time. The J’s competed in their own exclusive regatta during the America’s Cup lay days on the 16th, 19th and 20th June. Due to the size and draft of these magnificent yachts, racing took place in Murray’s Anchorage on the Bermuda north shore, where the red socked sailors aboard Ranger went on to take 4th place, Lionheart taking 1st.